Jacqueline Jossa enjoyed a well deserved night out yesterday as she partied in London with some celeb pals. The former EastEnders star enjoyed some time off from her parenting duties as she hit the town for a fragrance launch while husband Dan Osborne stayed at home with their two kids. Wearing a long black and white pleated skirt paired with a silky shirt and leather-look jacket, 26-year-old Jacqueline looked chic at the star-studded bash. Giving the cameras a big grin, the telly star looked happier than ever as she finished her outfit with some gold heels and a black bag. 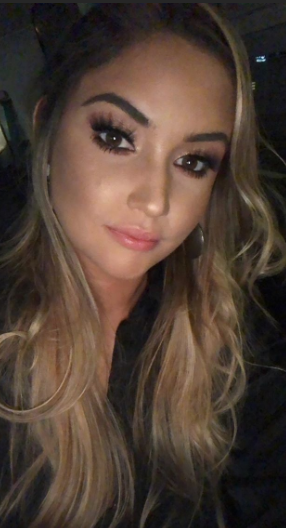 Sharing a selfie on the way to the glam party – which was also attended by the likes of Love Island stars Olivia Buckland and Ellie Brown – Jacqueline showed off her amazing smokey-eye and long lashes. While his wife enjoyed herself, former TOWIE star Dan seemingly stayed at home looking after their two children Ella, four, and eight-month-old Mia. 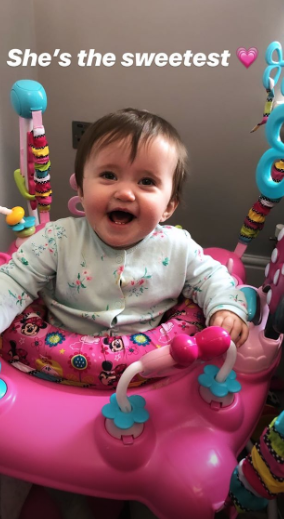 Taking to Instagram, the Celebrity Big Brother finalist posted a snap of his youngest smiling at the camera while sat in a baby bouncer. ‘She’s the sweetest,’ he captioned the shot. This comes after Jacqueline was said to have ‘dumped’ her hubby last month following allegations he kissed Love Island star Alexandra Cane during a night out – something which he strongly denies. ‘It’s not looking good right now, they’re arguing constantly and they’re sleeping in separate bedrooms – he’s moaning about it, saying if it wasn’t for the kids he wouldn’t be there at all. ‘They’ve been putting on a brave face in public but Dan can’t stand it because he says it’s a really negative environment to be in. 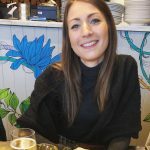 But the celeb pair have been keen to shut down rumours they’re on the rocks, as mum-of-two Jacqueline recently shared a photo pointing to her wedding ring placed firmly on her hand.